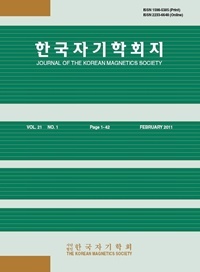 The Journal of the Korean Magnetics Society has been published bimonthly since its first issue was published on June, 1991. The published articles are academic research papers in either Korean or English, and their topics include magnetism, magnetic materials and their properties, information recording, magnetic applications and measurements, and other relevant topics. The papers in the Journal of the Korean Magnetics Society are classified into three categories; academic research articles, academic review articles, and technical reviews. The Journal of the Korean Magnetics Society has been evaluated by the National Research Foundation of Korea and accredited as an outstanding academic journal since 2002. For more detail, please visit the home page of the Journal of the Korean Magnetics Society.